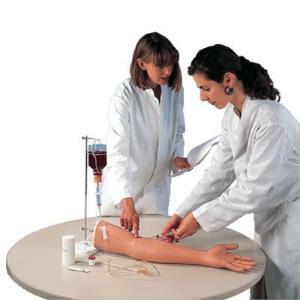 Teach correct puncture of peripheral veins for intravenous injections, blood sampling, and positioning of a butterfly catheter with this durable injection simulator made of 3B SKINlike™ silicone. Allows puncture of the basilic vein, cephalic vein, median cubital vein, and dorsal venous rete of hand. Ideal for group demonstration, this model includes an I.V. stand with artificial blood, two replacement tubing systems, plastic bottle, syringe, and storage carton.